I have been pretty hooked onto “experimenting with new ingredients” phase that is happening in my kitchen these last few weeks. The journey so far has been challenging, exciting and while i have been skeptical in being so experimentative, i am pleased to say it has yielded me pretty awesome results. This time i am bringing my first hand experience with “Masa Flour” and i am attempting a GF savory bread. So Excited !! In this series, i will explore the ” concerns of diabetes” and experiment with ingredients to create recipes which promote healthy eating. Each week, we bloggers bring to the table some recipes and talk about the benefits of the ingredients we use in those recipes. We believe that it is important to understand what we consume and thus try to pack in as much information about the ingredients in our dishes as we can. Hope u like it ! To begin, lets talk about some myths associated with it : Corn is Unhealthy and does not have any nutrients – Vegetables like kale and spinach may have better reputations as nutrition all-stars, but corn has something to contribute, too. Corn contains certain B vitamins and vitamin C, as well as magnesium and potassium. Now, for some good news ! Fortunately for people with diabetes, corn is a nutrient-rich food classified as a starch on the Diabetes Food Pyramid, along with grains, potatoes, peas and beans. With a glycemic index (GI) of 42, corn is also classified as a low-GI food, meaning that corn raises blood sugar by a relatively small amount. Improved Metabolism – One of the most important links between corn and diabetes is thehighlevelofpantothenic acid found in corn.Pantothenic acid is important for helping people with diabetes maintain a healthy weight through improved metabolic function and for managing blood sugar levels. Improved digestive health – Fiber in corn and other starches is an important part of nutrition and overall digestive health for people with diabetes. The high levels of folate found in corn that make corn a heart-healthy food also contribute to digestive health as well. Now for some consideration – Count your Carbs and include corn in your diet accordingly. A ½-cup serving of cooked corn or half of a large corn cob contains 15 grams of carbohydrate. Most people with diabetes should eat between 45 and 60 grams of carbohydrate per meal. Take 2 separate bowls, one for wet ingredients and 1 for dry ingredients. In the dry ingredients bowl, add in the masa flour, corn meal, salt, pepper, red chili flakes, soda bi carb and baking powder. Mix it well and keep aside. In the second bowl, crack open an egg and whisk it nicely. To this, add in the milk and oil and combine well till homogenous. Now, add this mixture into the dry ingredients and combine well. Add in the jalapeno peppers and cheddar cheese and gently fold in . Pour the mixture in a pre-greased baking tin/pyrex glass bowl and bake till done (approx 30 minutes). Check on it after 20-25 minutes and proceed baking accordingly. Once baked, remove from the baking tin/pyrex glass blow and let it cool down completely. Maiz masa savory bread is ready. This savory bread is really tempting and it was just right to enjoy with a side of home made salsa (recipe to come soon) and Greek Tzatziki . The top is all crusty and the inner is soft and full of chunky flavours from corn and jalapeno. This savory bread was so satisfying that just a couple of small pieces are enough for breakfast, you won’t feel hungry too soon and it will pack you with good energy . 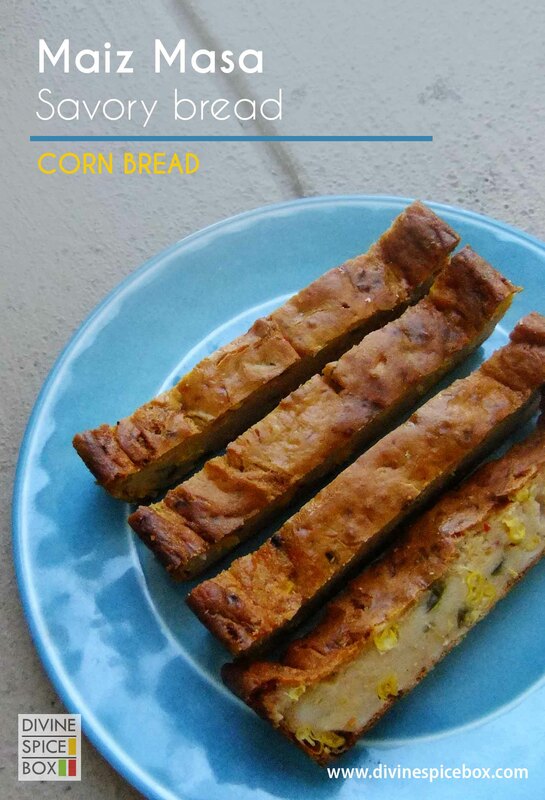 The texture is a bit different (dense) from your normal corn bread as there is no flour in this recipe but it is awesome this way. Cut it up in parts and pan roast it if u like it crunchier. Serve it hot !! Breakfast is made healthy and wise 🙂 Find some interesting DFT recipes from my recipe box here. Tagged Breakfast, Diabetes friendly, Gluten free, Healthy. Looks delicious! Never tried a corn bread before. Like you say, corn is so underrated, as long as organic corn is used, I think it has great value.